I really love TCM. In the next couple of days there will be reviews of a couple of Chaplin features and a Keaton feature, all thanks to a night of silent films on the channel. First up is this feature which was Charlie Chaplin’s first feature length which he wrote, directed, and starred in (heck, he even did the music). I watched THE KID (1921) on 11.17.10. It was my first viewing of the film. This is the story of the little tramp getting a littler tramp. 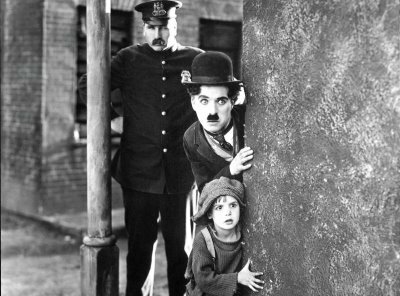 Chaplin finds a little orphaned infant, and raises him by himself. The bulk of this movie is set when the boy is five to six. He’s played by vaudeville find Jackie Coogan (who later gained fame as Uncle Fester in the ADDAMS FAMILY). This is the typical Chaplin story in that many small vignettes make up one big story. The kid breaks windows and the tramp gets paid to repair them. They get in fights. They get in trouble with the law. The mother wants her son back, etc. etc. As usual, Chaplin gets the most out of all these situations. The slapstick is spot on, even if there is less of it than in later films. The chemistry between Chaplin and Coogan carries this movie to great heights, and it never stops being fun. And, random note, but I love that the brute is wearing padded clothes. This has a fair share of symbolism, and it isn’t particularly subtle (when the mother is making the decision to abandon her baby, we see an image of Christ being crucified). Chaplin got much better at slipping in his messages as time went by, but it doesn’t ever pull anything from the fun of the film (though the dream sequence feels like run-time padding). As a Chaplin fan, I’m so glad I finally got to see this one. The next one, THE PILGRIM, is one I hadn’t heard of. But THE KID is one I’d always wanted to see. ~ by johnlink00 on November 17, 2010.